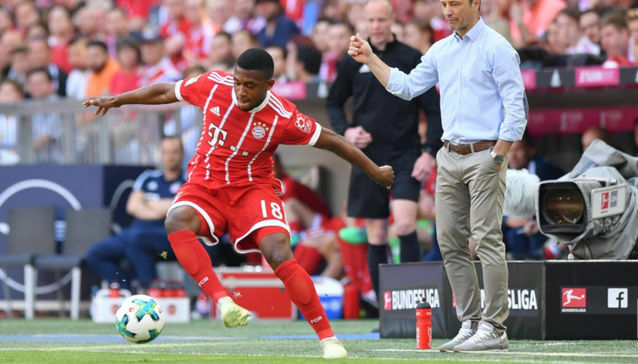 The Bayern Munich teenage prodigy dubbed ‘the Bavarian Hulk’ claims he rejected Germany for African champions Cameroon due to the inspiration of all-time record scorer Samuel Eto’o. Franck Evina, 18, chose to represent Clarence Seedorf’s side instead of Germany earlier this month, inspired by Cameroon legend Samuel Eto’o. Despite making his first-team debut for the Bundesliga champions this year and featuring for Die Mancshcaft’s U-18 side, the talented forward has opted four the country of his birth. “It’s my love for Samuel Eto’o that spurred me to play for Cameroon,” Evina told BBC Sport. “I’ve always admired him, he is a wonderful striker and I wanted to play like him. The thought of playing for Cameroon just like my role model was too attractive to ignore. The robust forward, who has been nicknamed ‘The Bavarian Hulk’ by Munich-based press, was called up to Cameroon’s U-23 team for their fixture against Chad, but did not make his international debut. “Watching Eto’o play for Cameroon was exceptional and getting to know that I can play for the Lions like him is incredible. “It was never an easy decision because both nations have very competitive and talented teams,” Evina explained. “But I believe joining Cameroon was the best choice for my career. Germany means a lot to me. I’m in one of the best clubs in the world and there’s a part of me that feels German.